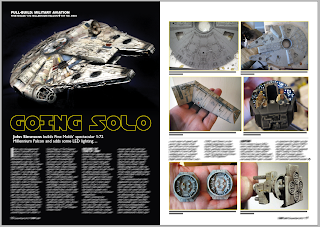 Recieved a preview of my Millennium Falcon Feature today from Tamiya Magazine, make sure you pick up December's issue to see the full 5 page build up of my 1/72 Falcon. I've also got a Ma.K 1/20 Großer Hund by Hasagawa on the bench. It's a great kit and suprisingly big, I know it's 1/20 but untill you start constructing it you dont realise what a beast it is. This is my first atempt at a Ma.K kit and its long overdue, I'm not sure what colour scheme I'm going for yet but its going to banged up that's for sure and I think I want to get a white wash involved to! All parts had to be given a good scrub in soapy water, there was loads of mold release grease on the parts. And here's where I'm at now, hopefully you can see the seams. There's a lot of filling and sanding needed on this model, I have seen people turn them into weld lines but I'm going for the smooth look. Hopefully full construction will be done by the end of the week then paint can start!